(CNN) -- Kansas Gov. Kathleen Sebelius was sworn in Tuesday night as secretary of Health and Human Services. Kathleen Sebelius dives into discussing the swine flu at the White House after being sworn in. She was sworn after she was confirmed by the Senate in a 65-31 vote. The timely vote puts Sebelius in office as the Obama administration is up against its first public health outbreak. She steps into the role as swine flu numbers climb worldwide. As of Tuesday morning, at least 90 cases had been confirmed, including 50 in the United States. Until her confirmation, the White House, which declared a public health emergency Sunday, was dealing with its first crisis without a secretary. But the administration said it was equipped to handle the situation. In most cases where a position is awaiting Senate confirmation, that job is filled by a career civil servant in an interim capacity. The Obama administration has named five nominees for the open positions. Sebelius met several obstacles during her confirmation hearings. The Kansas governor came under fire for her ties to Dr. George Tiller, a late-term abortion provider. Tiller and his staff attended a 2007 reception Sebelius held at the governor's mansion in Topeka. Sebelius originally failed to account for donations she received from the doctor. 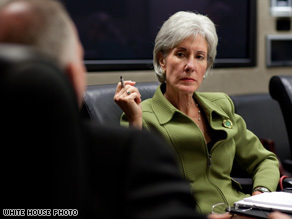 Will Sebelius be a bipartisan force for Obama? Sebelius also revealed in March that she recently paid nearly $8,000 in back taxes and interest. She said she had errors in her 2005, 2006 and 2007 tax returns. Sebelius, 60, is the daughter of former Ohio Gov. John Gilligan, who led that state from 1971 to 1975. A two-term Democratic governor in a Republican-leaning state, she previously served as a state insurance commissioner and oversaw Kansas' Medicaid program. She has been credited with boosting health care assistance for the poor during her tenure. A number of leading social conservatives have criticized Sebelius for her record on abortion, citing, among other things, her veto as governor of legislation that would have tightened abortion regulations in Kansas. In vetoing the measure last April, Sebelius wrote that the bill was problematic because it included no exceptions for pregnancies that endanger a woman's life and it allowed individuals to seek court orders preventing a woman from obtaining an abortion, even if the procedure was necessary to save her life. Some Republicans, however, have strongly defended Sebelius. Former Senate GOP leader Bob Dole, also from Kansas, testified on Sebelius' behalf in March, arguing that her record had proven her ability to work in a bipartisan manner. "Sebelius' strength is that she understands health care [and is] willing and able ... to bring parties together in very critical areas," he said. Kansas GOP Sens. Pat Roberts and Sam Brownback, as well as Republican Govs. Arnold Schwarzenegger of California and Jon Huntsman of Utah commended her selection. Former Sen. Tom Daschle of South Dakota, Obama's first choice for secretary of health and human services, withdrew on February 3 after controversy erupted over his tax records and over his work in a field that some consider lobbying.